As I mention in #2 here, my older children insist that the new baby’s name is “Joy.” It was the strangest thing: my four-year-old son got it into his head one day when I was still pregnant that that was the baby’s name, and has not backed down since then. When guests refer to her by her real name, he or my two-year-old will adamantly correct them that she is to be called “Joy.” They’ve been so insistent that our family has just given up and officially given her that nickname. Meanwhile, her real name is Catherine. It’s odd because Catherine was never a name I’d felt drawn to — it wasn’t even on the list for consideration with my other daughters. Yet as soon as I found out that this baby was a girl, I knew that that was her name. We never seriously discussed any other options. I didn’t feel like I was choosing a name for her as much as it seemed like I was just articulating the name she already had. I wondered if perhaps there was a reason for this, so I prayed to know if there was any particular saint named Catherine whom she was supposed to be named after. Soon after I said that prayer, a package with a painting of St. Catherine of Siena arrived in the mail. My uncle had been traveling Italy and just so happened to be in Siena on the day she was born, so he got the picture of the famous saint for the baby. He didn’t know what day she was going to be born — it was just a “coincidence” that he was in Siena that day. Her family gave her the pet name of Euphrosyne, which is Greek for Joy. I just love Catherine of Sienna, she is one of my favorites, but I didn’t know she was nicknamed Joy. It sounds like St. Catherine has been interceding for your little bundle of Joy from the beginning. What a blessing. When I was pregnant with my 2nd, the older son insisted that the baby was a girl and her name was Katie! He wouldn’t even discuss the possibility of having a baby brother. When the time came we had no boy names, but we had been referring to the baby for 6 months as “baby Katie”. Of course he was another boy! We finally chose his name purely because it sounded kind like of Katie (at least the name we call him, we did choose his first name for better reasons! Joel, which means, Jehovah is God). Sometimes God speaks to us through our children. In fact, I find that he does this quite a bit. Goosebumps of the best kind! Wow! I always felt great responsibility in naming our children as names are so personal and powerful. I do feel that I was just affirming the choice that God had made for them because the names just fit right from the beginning. Your “Joy” is such a beautiful blessing! Hi. I just found your blog today and LOVE your story. It is so beautiful to see God’s work in action. His mystery is so awesome! Many blessings of much more JOY to you always. Oh, p.s. I’m going to add you to my blogroll at aeternus! I love St Catherine, too. One of my daughters has her as a patron. I’ve been reading more of/by St Catherine lately… wowsa! She’s even better than I knew! I like how you said you were just “articulating the name she already had.” That is our approach to naming our babies. We pray and ask the Lord to tell us the baby’s name and we always have one name at birth and it’s always the right name. we’ve never named a son Mary, honest! And we normally don’t find out gender via ultrasound. With number 6 we did, but we already knew his name before that. Reading this gave me goosebumps! Princess is insisting that her baby brother’s name is Matthew. It has always been on my list of possible names but never really clicked. Could it be that we’re experiencing something similar in my house? Oh that story gave me a tingly feeling up my spine. How perfectly delightful. Especially the painting of St Catherine. That story is a signal grace. That is such a consolation. God is with us! Congratulations on your new baby girl! I’m a new reader, I happened to stumble upon your blog a few days ago. Thank you for sharing your story and I look forward to reading more of your posts! What a story! 🙂 I really need to ask God what my baby should be named… we have a boy name ready, but change my mindfor a girl constantly! That story is nuts! I can’t even believe it!!!! I literally am stunned. What on earth are the odds?!?! I just love when things like that happen. God must have big plans for little Joy! What an incredible story! And baby Catherine/Joy has *2* wondeful names! Sometimes the Lord works in mysterious ways… and other times He just smacks us upside the head with the truth! Awesome story! That’s awesome! I have a Caterina, also (I kept the traditional Italian spelling/pronunciation of the name). Wow!!! How cool is that? We feel like we aren’t really choosing the name for our baby but just giving him the one that is obviously right as well. It’s not one we considered before, but it sounded right, and when we discovered the meaning it was just perfect. I feel a little less silly about it all now hearing your story. I guess that is just the way these things work sometimes! Wow! That is so cool! Sometimes God uses that “still, small voice” and other times He just whacks us over the head. If God was so specific in His plans for her name, I wonder what kind of incredible plan He has for Joy/Catherine’s life? Wow, amazing. When you’re open to God’s voice, you can hear him…even (maybe especially) coming from a four-year-old’s mouth. Catherine is a beautiful name, as is Joy (my own dd’s spiritual name) and I love love love your story of how she came upon her name. I wish I’d been religious when pregnant with my dd so I could have had a saint helping me with naming her – I got it completely wrong and spent years sorrowing about it. (I knew from the beginning it was wrong, I should have fixed it then, but – wel, family!) Now she is changing it herself but its such a weird and difficult process. So lucky little Catherine! Her name will always be a blessing to her. That’s such a great story! My Mother was named Elizabeth Joanne, but her 5 year old brother threatened to run away from home if they didn't call her "Joannie", so they Baptized her Joanne Elizabeth! It is wonderful when siblings just KNOW something! God Bless your family and your sweet Joy! your sweet baby could do a lot worse than to have St. Catherine in her spiritual corner. Of course, she is my namesake too, so I might be prejudice. Joy is a beautiful name. I would love to have a girl named Joy! Holy cow, that gave me goosebumps all over. What a wonderful story and what a beautiful name (and namesake!) for your baby girl! Personally, I think Catherine is a lovely name. Since it’s mine. But that’s a great story—I had no idea where you were going with it. I just thought her name would be Catherine and she’d always be explaining why everyone calls her Joy. What a beautiful post. It brought tears to my eyes! Congratulations on your daughter Catherine aka Joy. “I didn’t feel like I was choosing a name for her as much as it seemed like I was just articulating the name she already had.”I felt something similar with my youngest. He was Harrison all the way through my pregnancy, that was the boys name I had been carrying for years before he was even comtemplating. He was born, I was shattered – as you are LOL. We got told within 10 minutes he very likely had Downs syndrome, we then shattered and in shock experiencing a range of emotions from I don’t want a baby who has Downs through to fierce maternal protection that I would love him even more if they were right. My husband picked him up and said “hello Harrison” and inside me was a powerful thought/emotion “he is not Harrison, he is Noah.” It nearly came straight out of my mouth. He immediately felt drawn to it to yet we hadn’t discussed it and neither of us could think of him as Harrison again. It was strange because we are fairly straight laced protestants yet I felt as if it came from God. That is such a great story! Thank you for sharing it. We knew our baby (born a week after your Joy) was to be named her name, Emmeliese, since before her older sister was born four years ago. Right before Emmeliese was conceived, I had a dream that I was calling her to me. I woke up and told my husband “I was calling for Emmeliese!” When I found out I was pregnant, I knew it was her. It was really neat to know for so long that we were just waiting for her to come to us, whenever that might be. When she arrived, I felt like her knew her already. God is so good, eh? Your post gave me shivers! God always, always has a plan, though we may not want to see it. How wonderful and awesome and amazing that your little ones _insisted_ on calling her joy. Fabulous. I, too, had a moment when I KNEW the name we’d considered for our first daughter was It. It’s marvelous thing, knowing it is the Right One. Jennifer, what stands out to me on this post is that you took the initiative to research and find the connection that you felt intuitively must be significant in your heart. As an atheist, this “coincidence” would have been just that, and therefore, none of the beauty and goosebumps that have emerged since would have happened. Without faith, the world is the world. With faith, it is much more. I got the goosebumps too, by the way, because of your faith more than anything. Keep sharing. Your before and after faith perspectives are truly a blessing to us all. Eternal God, eternal Trinity, you have made the blood of Christ so precious through his sharing in your divine nature. You are a mystery as deep as the sea; the more I search, the more I find, and the more I find the more I search for you. But I can never be satisfied; what I receive will ever leave me desiring more. When you fill my soul I have an even greater hunger, and I grow more famished for your light. I desire above all to see you, the true light, as you really are.I have tasted and seen the depth of your mystery and the beauty of your creation with the light of my understanding. I have clothed myself with your likeness and have seen what I shall be. Eternal Father, you have given me a share in your power and the wisdom that Christ claims as his own, and your Holy Spirit has given me the desire to love you. You are my Creator, eternal Trinity, and I am your creature. You have made of me a new creation in the blood of your Son, and I know that you are moved with love at the beauty of your creation, for you have enlightened me.Eternal Trinity, Godhead, mystery deep as the sea, you could give me no greater gift than the gift of yourself. For you are a fire ever burning and never consumed, which itself consumes all the selfish love that fills my being. Yes, you are a fire that takes away the coldness, illuminates the mind with its light and causes me to know your truth. By this light, reflected as it were in a mirror, I recognise that you are the highest good, one we can neither comprehend nor fathom. And I know that you are beauty and wisdom itself. The food of angels, you gave yourself to man in the fire of your love.You are the garment which covers our nakedness, and in our hunger you are a satisfying food, for you are sweetness and in you there is no taste of bitterness, O triune God! That is amazing and wonderful! Catherine and Joy both suit her. How wonderful God is. Beautiful story. I love it for many reasons – here’s two of them. One, my name is Catherine, and I was named for St. Catherine of Siena. The second reason is a long story – suffice it to say I had a similar coincidence when choosing a confirmation name for my infant daughter who died at four months. This time St. Catherine of Alexandria let us know she was to be our baby’s special patron. St. Catherines are amazing, aren’t they! Wow. That pretty much takes away any chance her name is a coincidence. Wow! Don’t you just love it when God gives you your answer so plainly and clearly?! I love this! It gave me goosebumps when I got to the end. This little Joy of yours is near to my heart because of our Aliza (hebrew – joyful) Joy. Her daddy calls her Joy most of the time and she is truly the personification of JOY. It makes my heart happy to think of your Joy growing into her name. Perfect. The order you should love people. My mom referred to all my kids as Little Ignatz before they were born. That’s so awesome! What a happy thought — the connection between the names and your daughter with the saint! So lovely. I had chosen St. Catherine of Siena for my confirmation name. I had been reading a little biography of her at the time, and was in awe of her love of suffering for Christ. God bless Joy and her clever, inspired siblings! What a beautiful story! Catherine of Siena is a wonderful saint. It’s so good to know that she’s been interceeding for your daughter all this time! Praise God! Goosebumps here as well. I love stories like this. This story made my day……God is so good……and my daughter’s name is Catherine, and I too have a devotion to C of Sienna for her, My Catherine is the most thoughtful, beautiful, person I know….she shines from her soul…some days I cannot believe the Lord entrusted such a pure soul to me! I am sure your Catherine will be the same….what a special baby already! And I LOVE your blog, I share it with many people, it has taught me, a cradle Catholic, so much, keep up the great work, you are making a difference in the world, and you do not even know it! she is beautiful + i love the name! I love the fact that St Catherine was the youngest of 25 children, too — good thing her parents didn’t decide they’d had enough. Our little girl’s name is Catherine Aurelia- pure gold. I was reading in our diocesan paper a few weeks after her birth that she was born right around the feast of St. Aurelian. I never knew there was such a person! That gave me chills. How awesome!!!!! I love these stories when you just know, “God did that”. When I was pregnant and then miscarried my 3rd child I was so devastated. We had waited so long for that baby. 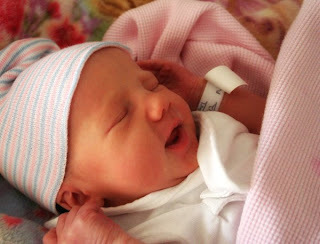 I got pregnant again shortly after and Audrey Genevieve was born on November 4th, 2006. I was scheduled for a c-section on the 7th and had begged for a VBAC. The doctors had said no, it was too risky but my body and God had other plans for me and she came early and too fast to section. My miscarriage was November 4th, 2005. She was born exactly a year after our last baby met Jesus. God spoke to me that day. That brought tears to my eyes. What a lovely story. My 5 year old was determined that our baby should be named rejoicing. Not joy or joyful, but rejoicing. So I searched the internet for names that meant rejoicing and that is her second name. He was very upset at first when he heard it, until I told him what it meant. He has only ever called her by her middle name. wow…I can't believe this….so amazing!!!!!! "Then David comforted his wife Bathsheba, and he went to her and lay with her. She gave birth to a son, and they named him Solomon. The LORD loved him; and because the LORD loved him, he sent word through Nathan the prophet to name him Jedidiah." I had a nun teach me first grade… Sr. Euphrosyne. I'm wondering why she didn't go by Sr. Joy. Wow, what a wonderful story and I also love St. Catherine! I remember when I came into the Catholic Church, St. Catherine of Siena was one of the saints I read about and I was so inspired by her extreme devotion to God. Indeed, her every breath seemed to be devoted to Jesus. 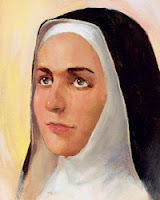 I remember reading she even received a ring from our Lord as a sign of her devotion to him (like a nun). Isn't God cool??!! 🙂 I tell you sometimes our little ones hear better from Him than we do. I love your blog BTW. so neat. God is so cool. My sister has always been named Susan, and her birth was told to my father when he was praying at a retreat. "Mary will have a sister names Susan" came to him and so he wrote it down and passed it to my mother, who shook her head no at him, then found out she was pregnant a couple weeks later… I predict great things for my sister and for baby Joy. This is an amazing story. It is always good to go with your 1st choice that comes to heart and never second guess yourself. When it comes down to being uncertain, like they say prayer is really powerful. God can answer our prayers when we doubt and a great example of this was certainly shown in your story. What a marvelous read, It sent shivers all over me (not bad, good ones). I read all the way through the biography and I can understand why your jaw dropped. Even for the fact that your uncle sent you a picture of St. Catherine in the mail. I think your little girls name was meant to be and what a beautiful name Catherine is. Wow, this gave me chills! What a beautiful story. What a beautiful example of God’s love. I particularly enjoyed this story because my name is Joy. When I was born my parents had only come up with names for boys and didn’t have a girl’s name, but my mother tells me she looked at me and knew that I was “Joy”. When it came time for me to have my own children, my husband and I couldn’t find a boy’s name we liked when our daughter was born, only a girl’s name; and same for when our son came later – we only had a boy’s name and not a girl’s name. OK, so I know that I am a good two + years behind on this story, but I just read it for the first time. I got goose-bumps when I read the last two sentences. Yes, sometimes your children are just meant to have the names you have given them. I tell people all the time that God named my children because their names are nothing that I ever had on any list of mine. While I was expecting our fourth child, the surprise baby, we were drawn to the name Chiara. I also liked that it was part of an art term, since I am an artist. Chiara means light or pure. I also wanted to give her a biblical name. As we listed names from the bible, I said Elizabeth, and I knew that was her name! Elizabeth means Gods promise. All of our children have one Italian name, a biblical name and a nickname ending in the ee sound. Finding a nickname for Chiara was challenging. We finally settled on Ari. Only problem being is that I felt we had made up a name. After she was born I happened upon a tv show that had a character named Ari! It is Hebrew for lion. That validated her nickname for me. She is our little lion, no doubt! We named our daughter Siena Joy, after St. Catherine, but had no idea the Joy nickname until a friend of mine that had read your post told me! Crazy!